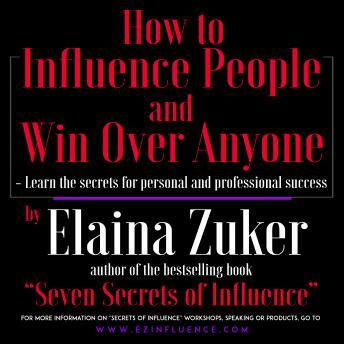 For just a few dollars and under an hour, you can master the same influence Skills Fortune 500 executives pay $2000 for at seminars "How to Influence People and Win Over Anyone" is based on "7 secrets of influence" the best selling book and corporate seminar. It has now been condensed into a valuable, user-friendly audio program you can listen to in your home, office or car. INFLUENCE. Every one wants it. But how do you get it? Influencing others is one of the critical business skills required for success today. Strong interpersonal and influencing skills are essential as we work in teams, interact with those from other disciplines, and sell our ideas and projects to upper management. It s Not What You Know ... It used to be that when we started up the corporate ladder, we were told that in order to achieve success we simply needed to put in our time and to develop our professional and technical expertise. After a while, this began to change and we heard that it' s not what you know, it 's who you know. We began to learn the importance of contacts, and how to build a network of helpful people. So What Is It? Now we have entered a new era. You can 't count on technical or professional expertise alone. These skills can quickly become obsolete. And you can' t simply count on your contacts to get what you want. High-level contacts can vanish overnight with the next corporate shake-up, budget cut, acquisition, or merger. What you need is something of your own, an inner resource or ability which you can tap whenever it 's needed. What you need, in short, is influence: a set of people skills that can serve you whenever and wherever you are, a set of interpersonal skills that you can practice anytime, anywhere, inside or outside an organization. We call it "portable power" In this dynamic, powerful audio program, How to Influence People and win Over Anyone I outline clear steps to show how anyone can have influence. Clearly and concisely I explain how influence is a set of interpersonal skills that can be learned, practiced, and mastered. This will allow you to become more skillful in your relationships with co-workers, bosses, subordinates and clients. Influence. Some people have it. Some don t. What makes the difference? This innovative audio program strips away the mystery from the art and science of persuasion. It shows you that the ability to influence others is a skill you can learn quickly and easily. No tricks, No magic. No manipulation. All you need is the determination to succeed, and this audio program! In this audio program, in less than one hour of listening time, you ll learn the six basic Influence Styles and which one is your natural style. Even more important, you' ll learn how to have better radar to develop the refined listening skills to identify the preferred Influence style of others your boss, your customer, your peers. You 'll learn some of the basic techniques top executives and influencers use to get successful outcomes. Which style is more effective for ....creating a common vision...fostering an open exchange of ideas....conducting a rational discussion of hard data....establishing trust....motivating others. You' ll make your voice heard and gain professional recognition Garner support for your ideas Move along projects important to your reputation and career Gain the attention of top decision-makers and management Win cooperation at every level Sharpen your competitive edge Win a promotion or a better job Anyone can learn to be a better and more effective Influencer. Use this audio program to get started on these skills TODAY.